Fooditka: Bring on the Husk! Most weeks, I stroll the Union Square Greenmarket for unusual goodies, and last week proved to be quite fruitful (pun intended). I found these beautiful husked tomatoes (aka tomatillos) that you see above. Completely unfamiliar with this fruit, I didn't know how to eat them let alone how to clean them. A helpful and far from shy sales associate showed me the way, gently pinching the papery skin at the bottom and then pealing it back to reveal a yellow cherry tomato. She popped one in her mouth and told me to do the same. I obliged and squealed with surprise and delight - they tasted like the sweetest cherries with little seeds not unlike in a tomato. The flavor was so delightful and exquisite that I tasted about three more and then, I bought the whole pint. Let me tell you, these little tomatoes have changed my life--and made my week much sweeter. I brought them to work with me for a snack, looking forward to popping them in my mouth and relishing in their addicting spritz of flavor. By the end of the week, I ate them whenever I could - mixing them in cereal, ice cream and even my leftover Mexican Risotto. They cost $5/pint, which isn't cheap but they've lasted us the whole week. You get about 40 pieces - and if I haven't stressed this enough, they're a gift that keeps on giving. Dan, who has an aversion to tomatoes absolutely loves them and refuses to believe that they're in the tomato family. Rock on with your husk on (or off)! Get them on Mondays at a booth near 15th Street and Union Square West. These look like little lanterns. Can you use them as regular tomatoes? I see them in South American supermarkets. Never dared to try them. Agreed - I discovered tomatillos last summer. Try a tomatillo salsa! Super yummy and simple to make. Great for huevos rancheros, enchiladas or just chips! Those are Cape Gooseberries! A relative of tomatillos, but different. Much sweeter and riper. They are indeed delicious! Thanks for the tip that they're in season now! 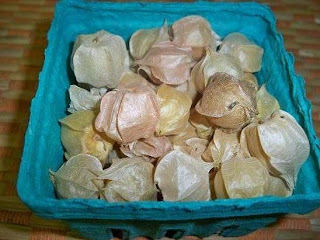 Thanks Harlan - they do look exactly like Cape Gooseberries. They are so delicious - go and get 'em. Shannon - good idea about the salsa! Anon - definitely try them, they rock! Yes Meg - I'd love to see it!